I recently visited Nichelini Estate Winery, located in Chiles Valley AVA. Chiles Valley is in the Vaca Mountains to the East of the Napa Valley floor. A winding road from Silverado Trail led us up to a nineteenth century home that is now used as the tasting room. We had an appointment with Doug Patterson, but we were early. We were given a glass of white wine and wandered around the grounds. (I brought a friend along as California Girl is pretending to work hard on the blog in Europe.) The building is on the side of the cliff, with a steep staircase leading down to gardens below in which you can sit shaded by trees and enjoy the wine. California Girl comments: That’s right, I am working hard; drinking wine, eating fantastic food, and visiting beautiful places. 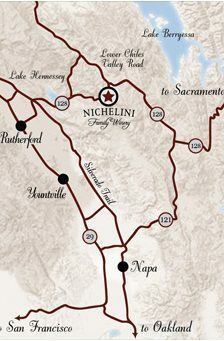 I am bummed I am missing out on the Nichelini Estate Winery, though. I trust The Brit brought me a bottle of wine or two home to sample? This introductory glass of wine was the 2015 Roman Press White. The nose was dominated by aromas of hazelnut. Taking a sip, I experienced a soft mouthfeel and tasted peaches and a sweet fruitiness. I prefer my white wines drier and with more robust acidity, but this was simultaneously easy to drink whilst offering some complexity. I know several people who would love this wine. The wine is a blend of Sauvignon Blanc, Muscadelle, and Semillion. The tasting room was busy, as we were there on the day that they released their 2012 Cabernet Sauvignon. We stood on the porch and talked with Doug, whilst tasting this new release. The nose on the wine was a complex mix of cherry, redcurrant, and pepper. Medium acidity was well-balanced by raspberry and tannins that were initially subtle but wrapped around the tongue in the finish, imparting a soft smokiness. This wine is not the classic Napa Cab, but a more subtle expression of the fruit. It sells for $52. Doug chatted to us about the family and the vineyard. The first generation of the family had twelve children, helping to ensure there was plenty of family members to run a vineyard. They employ two non-family members in the tasting room. The winemaker Aimée is a fifth generation Nichelini. She has held the position of head winemaker since 2009, having graduated from UC Davis in 2003. Aimée is the winery’s seventh winemaker; all of whom have been family members. The next wine we tasted was the 2012 Old Vine Zin. The vines were planted in 1929, The nose was a rich mix of cherry and baking spices. The taste was of plums, but not jammy. There was no trace of pepper. An easy to drink wine, more reminiscent of an old-world wine than the fruit-bomb approach that many associate with California Zinfandel. 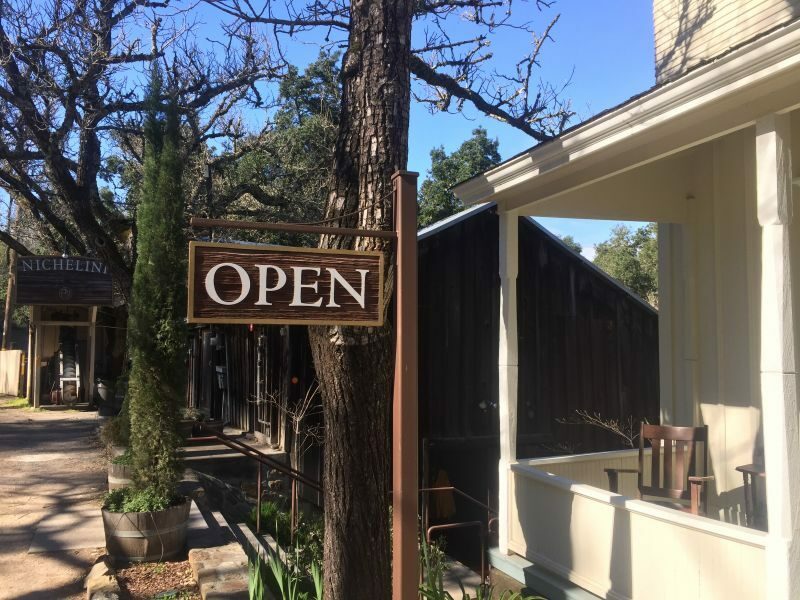 I mentioned that the winery was approached by a winding road from the Napa Valley floor; it seemed an odd place to place a business in the nineteenth century when that road was basically a dirt-track at best. Doug explained that the Vaca Mountains were full of working mines and that the Italian immigrants working there would consume wine at the end of a long day. These miners were the early customers of the Nichelini winery. The business boomed, enabling the construction of the family home five years after that first vintage. 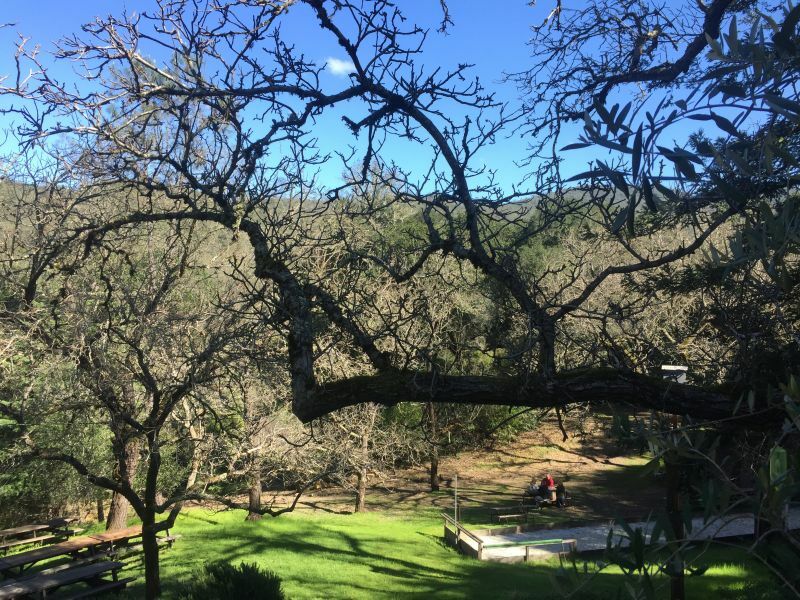 Doug explained some of the ways in which Chiles Valley differs from the Napa Valley floor. It is nine-hundred feet above sea level and the valley is open at both ends, enabling sea breezes to waft through it, lowering the temperature by 10F compared to the floor. Stood on the porch, we could feel that cooling wind. Doug explained hat there are just seventy-six basic soil types in the world, thirty-three of them are found in Napa Valley; sixteen of which are present in Chiles Valley. These factors enable a wide range of grapes to thrive and create wines that are lighter in body than those from the valley floor. 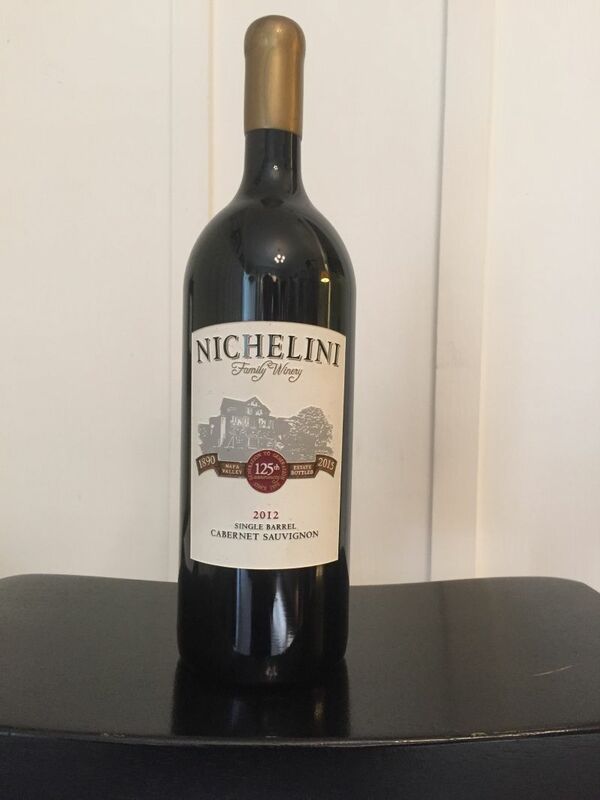 All of the Nichelini wine is made from grapes grown on their estate, which covers five-hundred acres in this valley in the hills. The next wine was the 2013 Petite Sirah. The nose was predominately cherry. Taking a sip, I was struck by the high acidity and then by rich fruit that led to a lingering finish of black cherry. I think this is a wine that is a little young to be enjoyed now and needs a few more years to be at its best. Whilst we talked, visitors continued to arrive, Doug would apologize, break off our conversation and greet these visitors as friends. Many of them were members, often introducing friends to the winery. The warmth of the greetings and the enthusiasm with which these returning guests introduced their colleagues to Doug added to the sense of a friendly and welcoming winery. 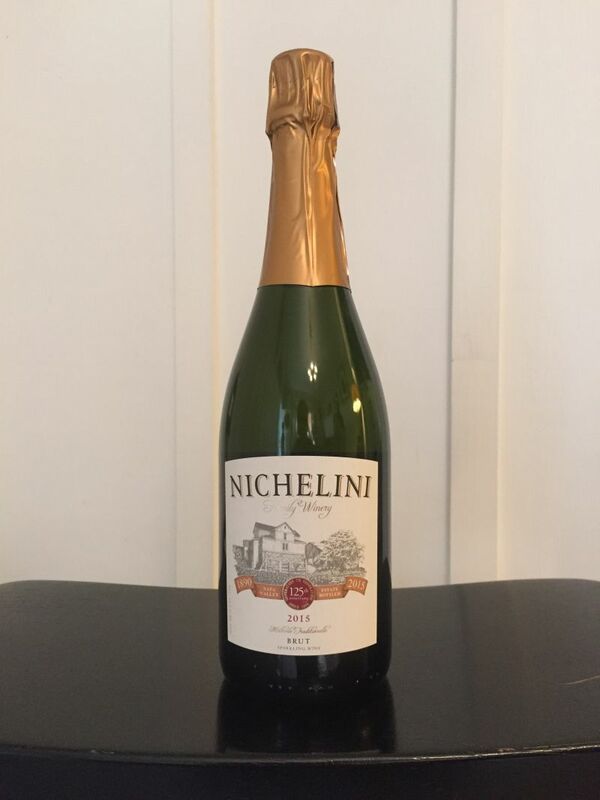 We then tried the Nichelini sparkling wine. Breaking from tradition, they use Pinot Grigio and Sauvignon Blanc to make the wine. The result was a dry, crisp, sparkling wine. It is low on fruit, with just a hint of pear. This would be a lovely summer sip, especially for those who do not like their sparkling wines to have a strong taste of yeast. California Girl comments: That sounds fantastic. I hope there is a bottle of that waiting for me at home! I asked how the winery had continued to operate during Prohibition. Doug explained that even during those dark days wine making and consumption was not completely outlawed. People could make two-hundred gallons of wine per year for personal use. Nichelini grew grapes that were sent East for people to make wine. Some wine was made to sell as vinegar. The third legal option was making wine for the Catholic church to serve during communion. The wine for this purpose was transported in a barrel on a truck, from which priests would fill their containers. Doug admitted that some of this wine may also have been sold to members of the public. The next wine we tried was, like the sparkling wine, not on the official tasting menu for that day. This was the 2014 Primitivo. DNA research has shown that Primitivo, an Italian variety, is the same grape as Zinfandel. However, there are winemakers who see them as distinct grapes and this Primitivo was a very different wine from the Zinfandel we had tasted earlier. The nose was a rich mix of spice and raspberry. The taste was light, with a spice backed flavour of black cherry. I think on a blind taste I would have guessed this a Pinot Noir. This was a splendid wine; my favourite of the day. The Primitvo was matured in American oak barrels with the wood coming from Missouri and West Virginia. 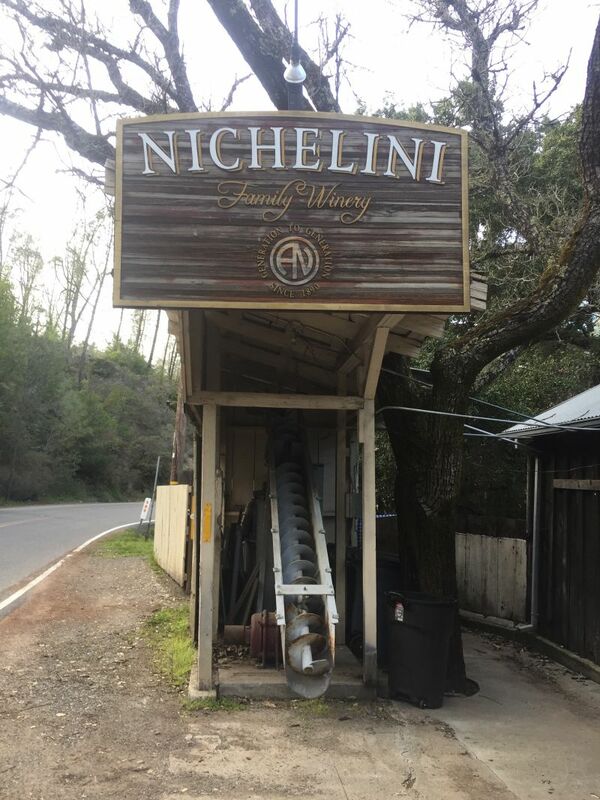 Nichelini is well off the beaten path, but the friendly family atmosphere combined with the history make it a detour well worth taking. The wines are not those that you might associate with Napa; lighter and more subtle. However, that description should not be taken as pejorative; there is a distinct character to these wines, a result of winemaker, terroir, and generations of family knowledge and hard-work.